A bunch of members & friends of the Milwaukee Makerspace recently gathered to try our hand at something that does not mix well with all the heavy machinery at the shop: alcoholic beverages! We attended a consumer cocktail academy hosted by Hendricks Gin at the Iron Horse Hotel, and we had a blast! 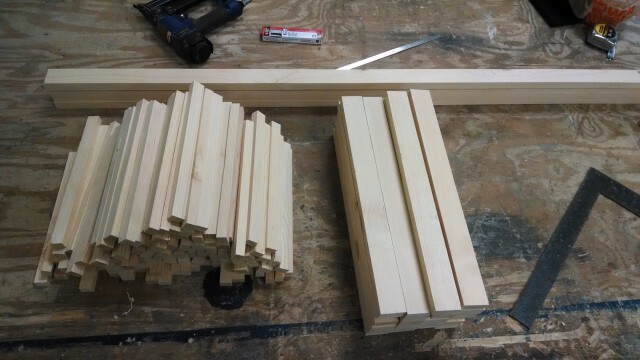 Last weekend I made a 60 bottle wine rack from some 1″ pine. I sized it to fit on a counter top in my basement, under the upper cabinets. I was pretty happy with the design of a somewhat smaller Belgian beer rack I made in the past, so I copied some of its basic style. 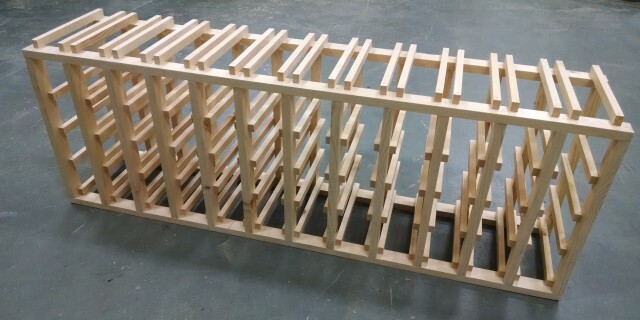 I really like the strong vertical lines of this design, as it contrasts with the strong horizontals of most wine racks. It took about 1.5 hours to cut the pieces, and 1.5 hours to assemble them. Note that I used a nail gun and 1″ long, 18 gauge nails for most connections, except the uprights to horizontals, where I used 2″ long nails. 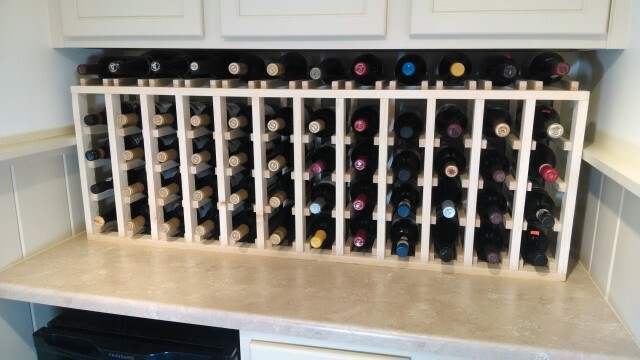 Check out the completed wine rack, made from $25 of wood and nails, in use! Laser Cut Cocktail Recipe Coasters! 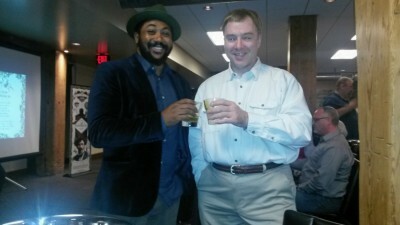 Years back, I used to throw a lot of cocktail parties. Between myself and two good friends, we owned five cocktail shakers and 35+ martini glasses. During the parties, we’d typically be the only three people shaking martinis for all the guests. 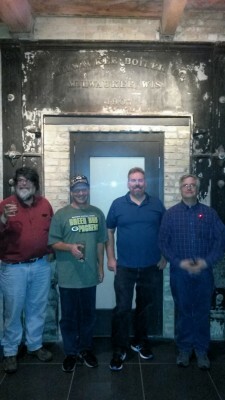 Though that’s awesome, it also means we missed out on much of the socializing and mingling during each party. In preparation for a recent birthday party, the solution came to me: Use Lasers! 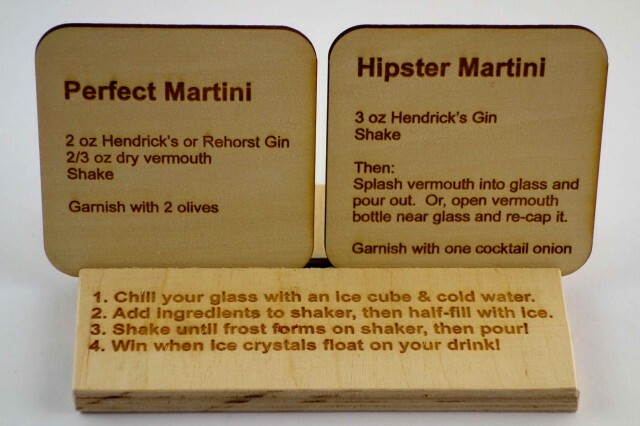 So, I laser cut ten coaster-sized pieces of basswood and then laser engraved my twelve favorite Martini and Champagne cocktail recipes on them. 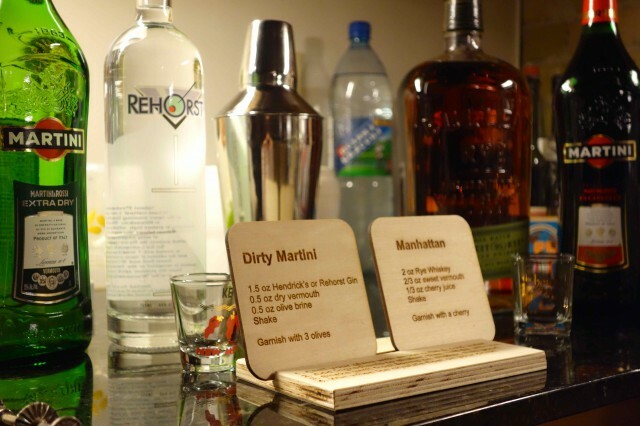 I also cut stands for them that had a laser engraved “best practices” guide for shaking Martinis – you know, the things that bartenders are typically too busy to do for you: Chill your glass before pouring your drink into it, shaking your drink until it is sufficiently cold, etc. 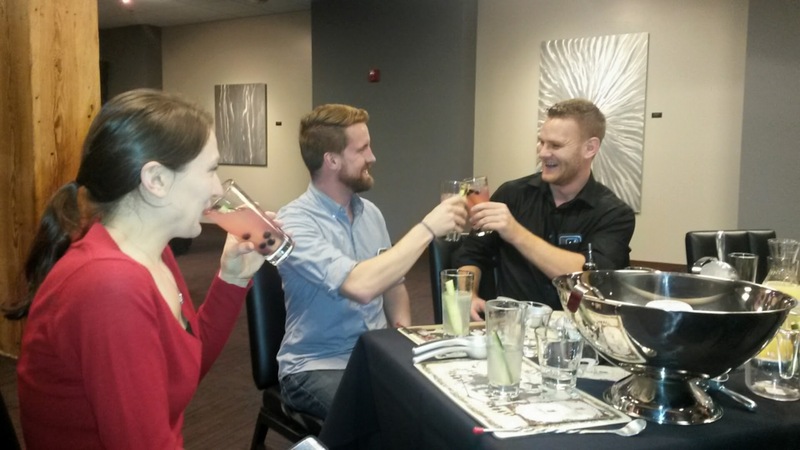 The drinks have recipes that taste better than what most bartenders will make for you, because they include things like an amount of lemon or lime that they’re too busy to squeeze into your drink. The party was an even more awesome experience for me, because I wasn’t only shaking drinks all night. 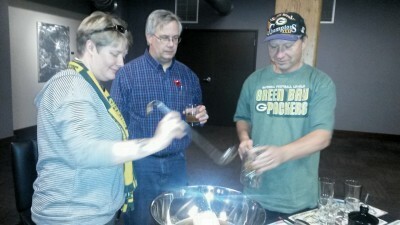 It was also even more awesome for the guests, as they found that great cocktails are super easy to make! And who doesn’t like to make things? Also, the carbonated Gin & No tonic is real crowd pleaser! 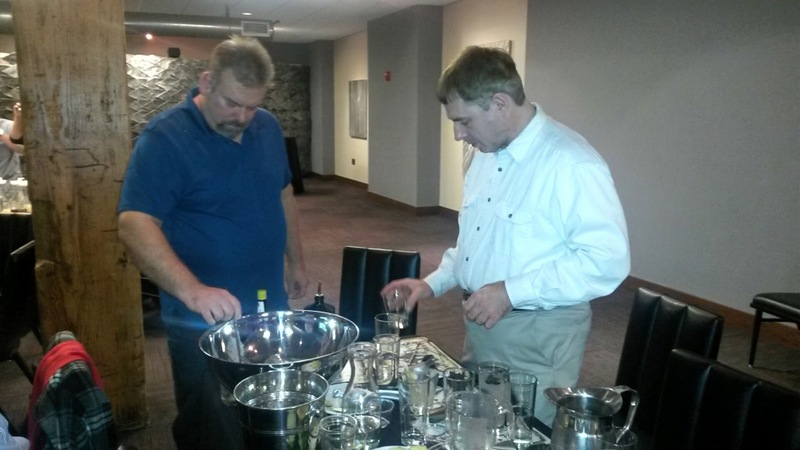 See my previous post about home carbonation for more info, and note that all types of inappropriate things can be carbonated: Gin, Ardbeg Corryvreckan, grapes, etc! Check out this video of the laser cutter in the middle of cutting 10000 circles! 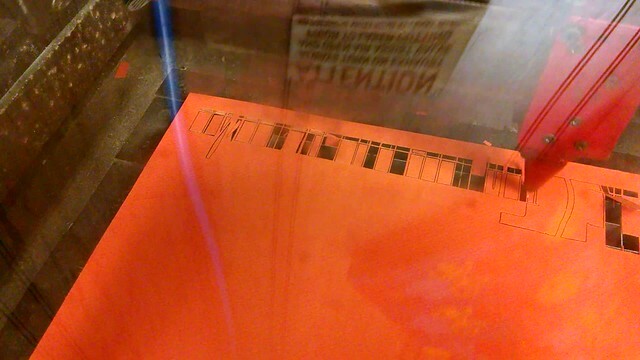 Note the mysterious logic employed by the laser cutter to determine the order of its cuts. From a quick test cut of a particularly dark area, I found that I needed to add an offset between each row and each column to account for the kerf of the laser. I.e. the laser beam has a cutting width that is wider than that of the line, and so in the darkest areas of the photo the halftone dots overlapped, causing a large section of the paper to fully detach. That led me to make this test strip with 11 shades of grayscale, evenly spaced between pure black and white. I laser cut this test strip with various offset distances between the rows and columns in order to arrive at the optimal 10% extra offset between adjacent rows and columns shown in the above settings. Note also that the smallest size circles may not even be exported from Inkscape due to their infinitesimal dimensions (i.e. if you export as a .pdf). The minimum gap between circles with 42% speed and 100% power on an 1133 pixel wide image blown up to 24″ is 0.79 pixels, which is 0.017″. 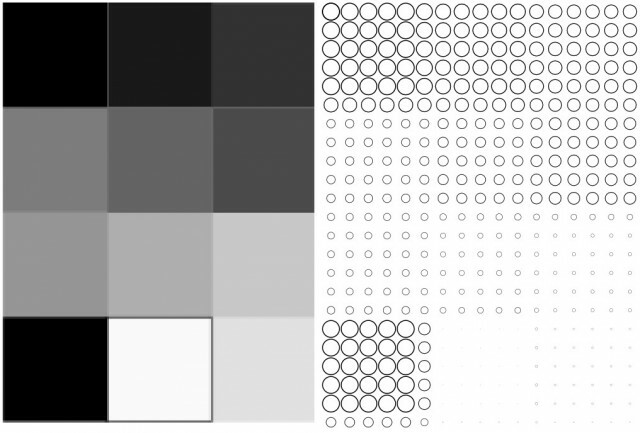 Applying these same settings to the image created a 128 by 81 array of circles, for a grand total of 10368 vector objects. In my first trial run last weekend, I found that sending this much data to our 60 Watt Universal Laser takes 5 minutes and results in a print error I noticed only after hitting start! After 1.3 hours of vector cutting, I found that a few of the rows and columns were shifted a bit from their intended location. It’s not clear whether this had to do with the print error, or if the paper moved slightly during the cutting process. In order to improve the second version (shown at top), I chose to move away from the rectangular grid of halftone dots – recall that Kays and London teach that hexagonal close packing is for champions. The reason to abandon the rectangular spacing is to improve the dynamic range (i.e. to make the blacks blacker). For example, rectangular grids of circles pack at an “efficiency” of Pi/4, which is 79%, whereas hexagonal close packing results in a pi/6*sqrt(3) packing, or 91%. That means that the darkest sections of the image will be darker, as more of the light colored “front” piece of paper can be cut away. See the image below, and note that the hexagonal pattern does indeed appear darker. I test cut this yesterday, sending ¼ of the data at a time to the laser to avoid printing errors. However, part way through the cutting, cut-out paper circles stuck to the long air assist nozzle of the laser head (ironically) hit a washer I was using to weigh down the paper to prevent movement while cutting. The paper shifted by about 1mm, which was enough to make some adjacent halftone dots overlap and cause others to have a visibly wider spacing. The vector halftone dots are perfectly circular, though the edges are a bit rough. Some of them have a very small border and so are a bit fragile. 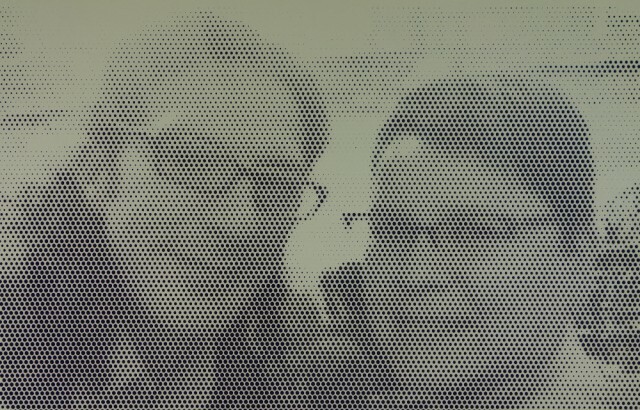 The raster halftone dots are not very circular, but the edges are very smooth and the boarders are slightly wider. I chose to raster cut the 24″ x 18″ image, and found that the raster cutting time of 1.4 hours was nearly equal to the 1.3 hour vector cutting time. The next step is to laser cut this image into wood. 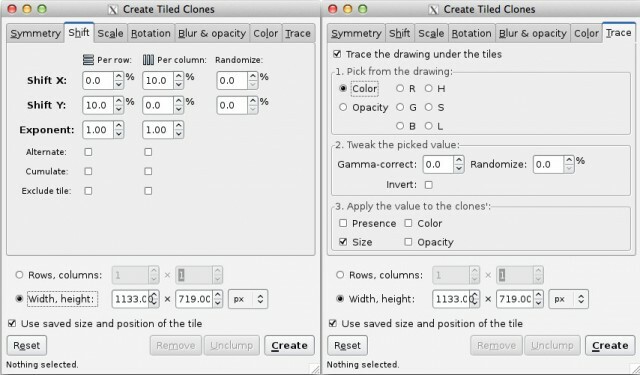 Also, Inkscape will let you draw any shape to create tiled clones from – so please do share photos of any halftone images you create with star shapes! I’ve been on a laser cutting kick lately. 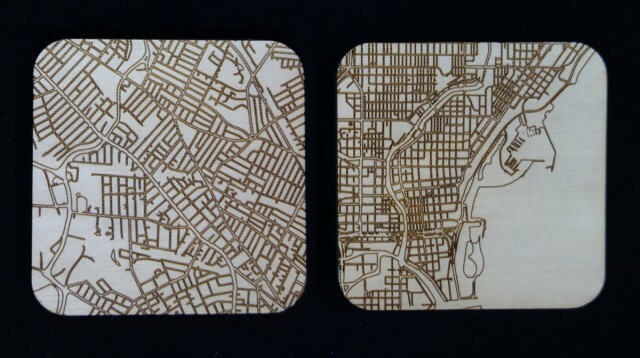 In the last two weeks, I made 9 travel coasters, two of which feature neighborhood maps of places I’ve lived. 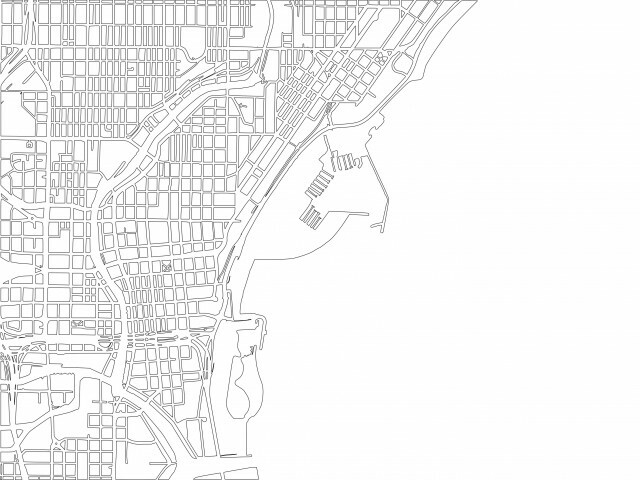 Though I could have just raster cut these very small coasters, generating the vector version allowed me to create this big map of Milwaukee, Wisconsin! This wall hanging map is the maximum size of our largest laser cutter: 24″ by 18″! Boom! This map was inspired by a project made by my friend NJStacie a while back. 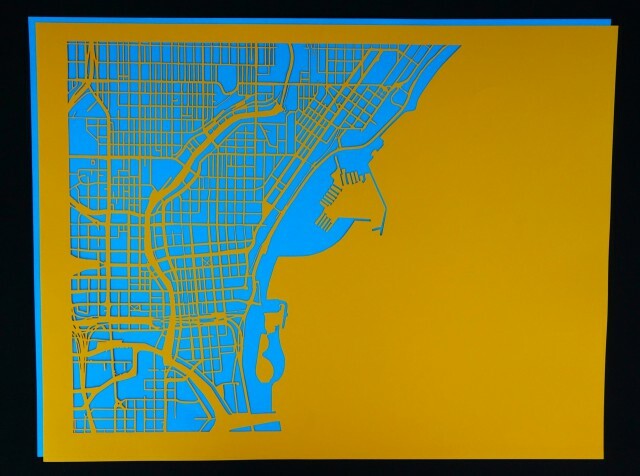 While she has both the infinite patience and the limitless awesome that allowed her to use an X-acto knife to cut out all the city blocks of Boston from an actual map, I used a laser cutter and software. To create images for my roadtrip coasters, I simply took screen captures of google maps, and processed them into vector files using GIMP and Inkscape. There are so many extraneous details in google maps (lines for buildings, the text labeling street names, etc), that it was clear I needed an alternate approach for making this map. I did a few test cuts to find a power/speed that cut all the way though some colorful, 98lb, 25″ by 19″ acid-free archival paper I picked up. The goal is to use enough power to cut though, without using too much power, which widens the kerf (laser cut width), thereby undesirably narrowing the streets. This ended up being 100% power, with 52% speed. 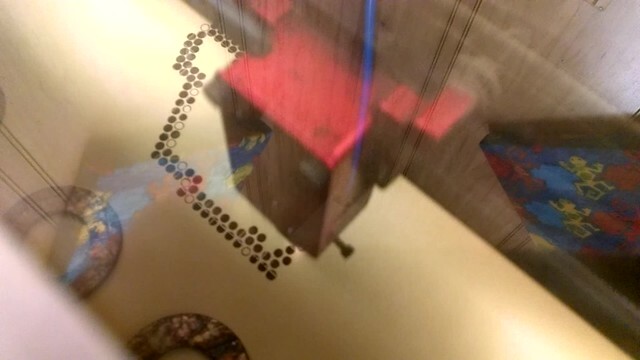 Check out the laser cutter in this real-time (not sped up) video. Note that one typical problem of having both air assist and super-power fume-removal suction while cutting is that the laser cut bits tend to flip over into the cutting path, potentially resulting in an incomplete cut. That meant when the laser cutting was complete, I had to carefully punch out the 15 or 20 stubborn city blocks that weren’t completely cut though. I also cut this design into a coaster, and made one with my old Massachusetts neighborhood too. Naturally this was a lot of data on a small surface, but the results are pretty good despite the vector cutting time approaching that of the raster cutting time! I cut these at 100% power, 100% speed, like the other coasters. After I completed all these steps, I learned about a way to access vector map data directly. The Open Street Map site allows export of .svg vector data just by clicking the share button on the right side of the page! Even better, one can zoom in to Milwaukee, and press the big green Export button on the upper left to export an .osm database of the visible section of the map. This OpenStreetMap archive can be opened in Maperative! and a style can be applied to the rendered map. Maperative has several styles built-in, and I simply edited the google maps-like style to omit all the buildings, and draw all roads, highways, on-ramps, etc in a black with no border. Maperative can export .svg files, but I found the content of these files are a bit of a wreck. For example, each different road type is a separate vector path, meaning that there are many separate paths in the file. 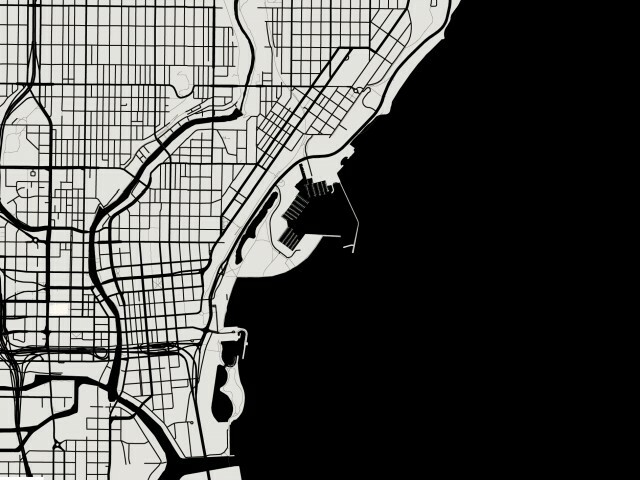 Ultimately I found I’d taken the wrong approach, as I should have rendered all the city blocks as black vector outlines, and omitted the roads – as that is what I really need to laser cut. With a bit more work, using Maperative would likely be a quite quick path from map to laser cutter. 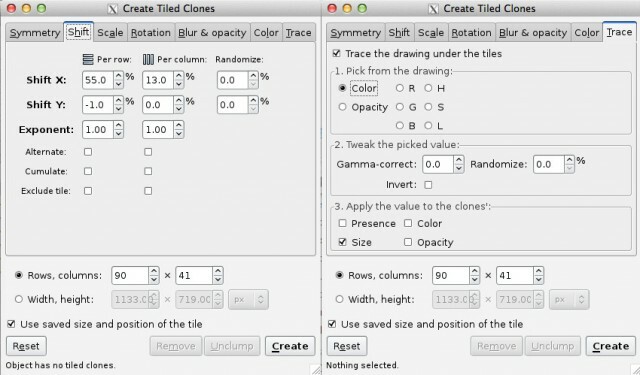 However, I abandoned this approach as I’d already created a somewhat reasonable workflow.